2018 U.S. National Figure Skating Championships – Ice Dance Podium (From L to R): Maia Shibutani/Alex Shibutani, Madison Hubbell and Zachary Donohue, Madison Chock and Evan Bates, and Kaitlin Hawayek/Jean-Luc Baker. By the slimmest of margins, Madison Hubbell and Zachary Donohue took the gold in ice dance, defeating silver medalists Maia and Alex Shibutani and bronze medalists Madison Chock and Evan Bates at the 2018 U.S. National Figure Skating Championships on Sunday in San Jose, Calif. Only a half of a point separated the three teams atop of the podium in ice dancing. Skating to bluesy routine to “Across the Sky” and “Caught in the Rain,” Hubbell and Donohue opened with level four synchronized twizzles that earned 3+ grades of execution (GOE) across the board. The team earned a level four on all elements except for their diagonal steps (level 3) and their phenomenal skate resulted in a break away from a string of three-consecutive bronze medals at Nationals. They finished second in the free dance (118.02), and with a total score of 197.12 points, were able to capture their first national title. The team, which trains in Montreal under Marie-France Dubreuil, Patrice Lauzon, and Romain Haguenauer, were fourth in the Grand Prix Final after a silver medal at the NHK Trophy and a bronze at Skate Canada. They were ninth at last year’s World Championships in Helsinki. They won the bronze medal at the same arena in their first Nationals as a team in 2012. The Shibutanis finished third in the free dance and and slipped to third overall (114.60/196.93 points). While solid, both step sequences were graded a level three and their program component scores were slightly less than that of the two teams which placed ahead of them. A few missteps in the diagonal sequence resulted in low GOEs and eliminated their chances of a third-straight U.S. title. The defending world bronze medalists, 23 and 26, have now medaled for 14 consecutive years at nationals through all of the ranks. They were ninth at the Sochi Olympics. Chock and Bates curved and spun in perfect symmetry to their “Imagine” program. A level four diagonal step sequence garnered 11.11 points alone, and the team earned +3 GOEs across the board for their level four intricate lifts. They finished first (118.99) in the free dance with the highest technical score of the night, but with a total score of 196.60 points, were not able to move up the podium. They have now medaled at nationals for six consecutive seasons, winning in 2015. This season, Chock and Bates were fifth in the Grand Prix Final after silver medals in both China and France. They were seventh in the 2017 World Championships and eight at the 2014 Olympics. Bates was 11th at Vancouver in 2010 with Emily Samuelson, making him a three-time Olympian. Fourth-place Kaitlin Hawayek and Jean-Luc Baker performed double-digit scores to an opening level four circular step sequence, as well as a level four diagonal steps later in their routine. The team earned a level four on nearly all their elements and showed the second highest technical score, finishing with 187.61 points, improving from fifth in the U.S. the past two years. 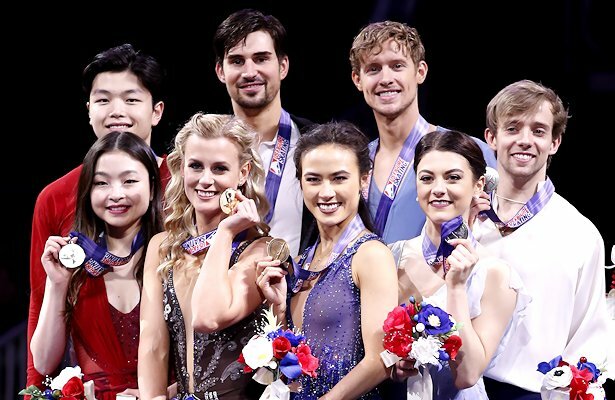 The 2014 World Junior champions, ages 21 and 24, were third at Golden Spin in Croatia last month after placing fourth at Skate Canada and fifth at Skate America. Rachel and Michael Parsons finished fifth with 176.07 points, just ahead of their rivals from juniors, Lorraine McNamara and Quinn Carpenter (175.19). The Parsons, ages 20 and 22, are the defending world junior champions. There were similar feelings from the team that won the world junior title the year before, in 2016. McNamara and Carpenter, ages 18 and 21, were fifth in the Cup of China on their first season on the senior circuit. The top three teams were named to both the US Olympic and World team. Hawayek/Baker, McNamara/Carpenter, and Parsons/Parsons were all named to the upcoming Four Continents team.